The choice of hearing aid styles and features is based on several factors including the exact type and degree of hearing loss and your individual needs based on your medical and audiological history. Hearing aids come in a variety of colors, shapes, and sizes. Hearing aid styles may be separated into two categories, standard or custom. The behind-the-ear (BTE) hearing aid has a small case that sits behind-the-ear and an earhook that connects to a clear plastic tube and a custom fit earmold. The mini behind-the-ear (Mini BTE) hearing aid is a small BTE style and directs sound into the ear canal through thin plastic tubing and a tiny earpiece. The receiver-in-the-canal (RIC) hearing aid has the speaker placed inside the ear canal. The small BTE case and the thin wire offers cosmetic and listening advantages. 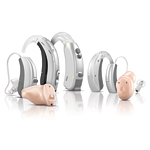 Custom hearing aids require that a custom molded shell be made which houses the electronics. 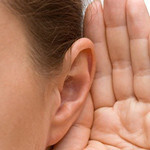 The in-the-ear (ITE) hearing aid is an in-the-ear custom instrument that fits entirely in the outer portion of the ear. The in-the-canal (ITC) hearing aid is a smaller custom ITE instrument that fits entirely in the ear canal. The completely-in-the-canal (CIC) hearing aid is this smallest custom instrument fits deep into the ear canal.